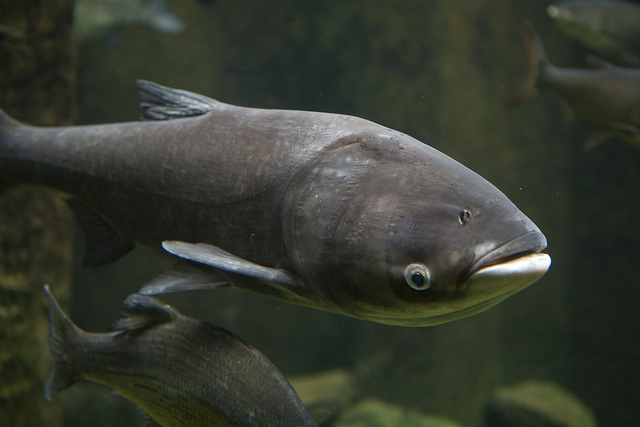 The advance of the so-called Asian carp (the term can refer to many species of carp, but in Illinois it typically refers to bighead carp and silver carp) has long prompted worries that the fish will wreck the Great Lakes ecosystem, including its $7 billion fishery. Its impending arrival has even energized debate over whether to spend billions physically separating Chicago waterways from Lake Michigan. The carp’s march up the Mississippi River basin even surmounted electric barriers set up by the Army Corps of Engineers to keep them out of the Great Lakes area. A new study in the Canadian Journal of Fisheries and Aquatic Sciences affirms that if the fish haven’t reached the Great Lakes yet, they’re very close. In 2010 fisherman hauled a 20-pound bighead carp out of Lake Calumet, and before that carp were found in the western basin of Lake Erie — the same locations where the researchers found carp environmental DNA, or eDNA. Fish shed tiny bits of tissue as they swim, which become diffuse genetic evidence of their presence. The eDNA can’t say how many fish are in the area, or when they were there. eDNA monitoring of invasive species is a relatively new technology. It can produce murky results, as in Minnesota where it may have misidentified carp DNA in the St. Croix river. The new study was authored by researchers at the University of Notre Dame, the Nature Conservancy and Central Michigan University, and calls for a larger surveillance program across the Great Lakes basin. Carp are abundant below the electric barriers near Chicago, can eat up to 20 percent of their body weight per day in plankton — a food source already under considerable pressure from invasive quagga and zebra mussels — and are known for leaping out of the water when agitated. But the carp remain elusive where their eDNA has been found, despite all the scrutiny from anxious fishermen and ecologists. Still, the latest findings are likely to reignite debate about whether the current defenses are enough. The Army Corps of Engineers is studying the issue, and will release a report later this year.